When the restoration started, the North Wing Passage was remarkably intact and the only substantial change was a missing ca. 1812 doorway that had accessed the cellar stair during the Madison era. The doorway was removed in ca. 1881 when the ca. 1812 cellar stair was demolished and a new stair was constructed. The portion of Montpelier's ca. 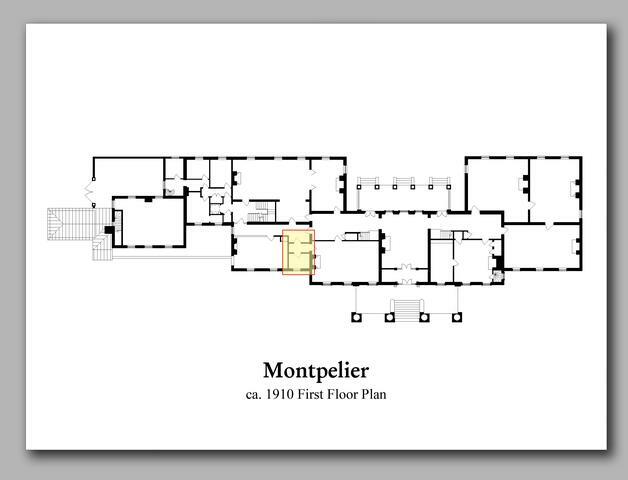 1910 first floor plan that is highlighted in yellow contains the North Wing's surviving ca. 1812 partitions.